The Kickapoo BRAVE Ride, which stands for the Bluffs, Rivers, And Valleys Event, is an exciting opportunity to bike the backroads of Driftless Wisconsin. Starting and ending in nearby Gays Mills, the Kickapoo BRAVE Ride will take riders on a tour through breathtaking scenery, along ridge tops with distinctive panoramic views and deep, lush valley roads. Featuring a cloverleaf route system, cyclists can choose which route is best from them between beginner, intermediate, and advanced routes ranging from 15 – 100 miles in length. If you aren’t up for the Kickapoo BRAVE Ride, there are still plenty of other beautiful ways to enjoy biking through Driftless Wisconsin. For your convenience, Crawford County has mapped out nine different routes using a combination of country and township roads. 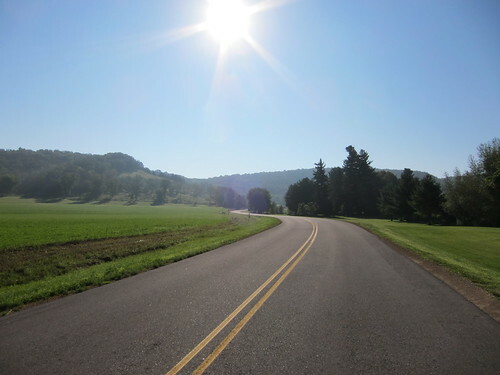 These loops are anywhere from 14 – 44 miles in length, and will take you through some of the most scenic portions of Driftless Wisconsin. In addition to this, Vernon County has mapped out five different routes leaving from Westby: the Amish Tour; Ski Jump Tour; Kickapoo Valley Tour; West Fork Tour; and Small Town Charm. Mountain Bikers will enjoy the trails in both the Kickapoo Valley Reserve, Wyalusing State Park, and newly created Sidie Hollow County Park. Whether it’s biking the Kickapoo BRAVE or one of these other great trails in Driftless Wisconsin, it won’t take you long to see why biking has remained a popular regional pasttime. Pack your cycling gear, and book your room at our Driftless Area Vacation Rental today.